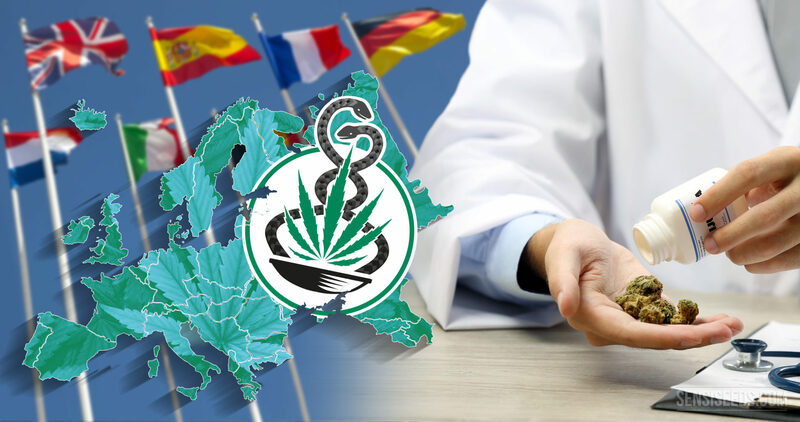 While there is plenty of accurate, up-to-date information online about medicinal cannabis in Europe, finding one reliable source to tell you everything you need to know can be an all-but-impossible task. So we’ve collated hundreds of online resources – news reports, analysis by governments and NGOs, and patient perspectives – in order to create a complete overview of the status of medicinal cannabis in Europe. We have striven for clarity and accuracy in all respects, but we recognise the fact that legislative waters can at times be murky and misinterpretations can be made. Added to this, legislation is changing rapidly, so we’ll be adding updates every three months or more if necessary. Thus, we welcome any comments, feedback, or corrections – and your input will help us to make this a truly interactive resource that will continue to be relevant for many years to come! This map shows the general state of medicinal cannabis legality and availability in Europe. All countries that have passed medicinal cannabis laws, that have approved whole-plant cannabis or cannabis-based drugs, or that make cannabis/cannabis-based drugs available in some form are marked green. At first glance, the situation looks relatively good in the majority of European nations. However, we need a little more analysis to really get a clear picture, as medicinal cannabis laws and praxis vary wildly between countries. Some countries that have passed laws supposedly allowing for the provision of medicinal cannabis do not actually permit anyone to use it; other countries do prescribe certain cannabis derivatives or synthetic cannabinoids, but do not allow whole-plant cannabis, while others have relatively relaxed laws that allow for personal medicinal cultivation, cannabis social clubs that supply medicinal users, and a range of different prescription medications. 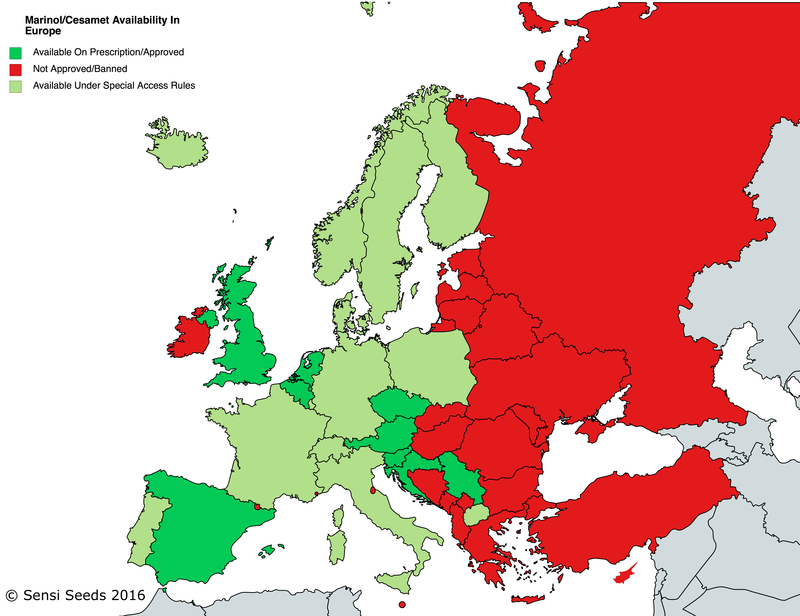 Some of the countries marked in green don’t actually have medicinal cannabis laws at all, and haven’t approved any existing cannabis-based drugs, but still make medicinal cannabis or cannabis-based drugs available to certain patients under special access rules. In these countries, the national health authorities usually import the drugs on a strictly-limited, case-by-case basis. Obviously they are not ideal systems, but if laws have been passed or if there are patients receiving cannabis drugs or derivatives in those countries, then they get included in the green section of the map. If you wish to know more about the cannabis-based drugs that are available in Europe today, please take a look at our post Cannabinoids in medicine – an overview for doctors and professionals, published in March 2016. First, let’s take a look at Sativex availability. Although controversial, Sativex has won considerable success in gaining approval in much of Europe and in many other countries worldwide. The reasons for controversy surrounding Sativex are manifold. 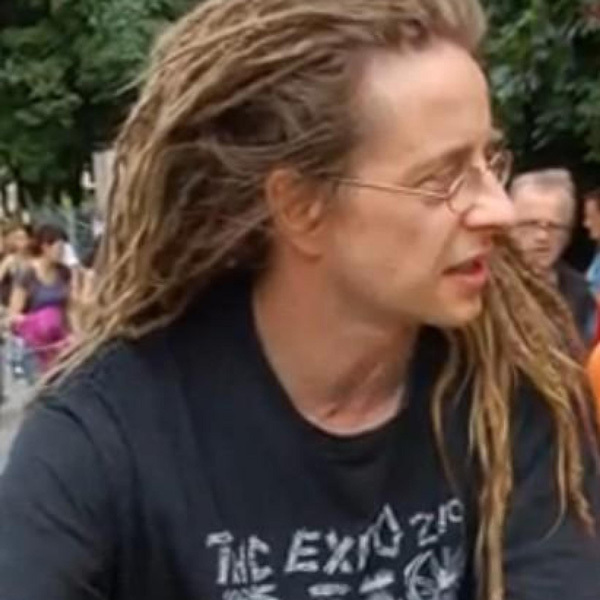 Many activists and patients believe that licensing and regulating Sativex while cannabis itself remains illegal (as is now the case in the majority of Europe) is unfair and discriminatory, particularly given that it is a whole-plant extract and thus is essentially cannabis (unlike synthetic, single-molecule drugs like nabilone and dronabinol, which we will discuss later). These issues are further compounded by the fact that Sativex is prohibitively expensive and inconsistently available in many countries. In the UK, Sativex is only available on the NHS in Wales. In August 2014, the All Wales Medicines Strategy Group (AWMSG) recommended that Sativex could be prescribed on the NHS (meaning that costs would be borne by the health authorities with just a small nominal charge to the patient) in Wales for treating MS-related spasticity. However, the UK National Institute for Health and Care Excellence (NICE) did not recommend prescription of Sativex in England in their 2014 MS Clinical Guideline “because it is not a cost effective treatment”. In April 2011, the Scottish Medicines Consortium (SMC – the Scottish equivalent to NICE) also announced that it was unable to recommend Sativex, as it had not received a marketing authorisation submission from GW Pharmaceuticals. Thus, patients in England and Scotland wishing to obtain Sativex must “go private” and cover all costs themselves. A similar pricing issue exists in France, where authorities approved Sativex back in 2013, but have yet to agree a sale price with GW Pharmaceuticals’ European distributor, Almirall. 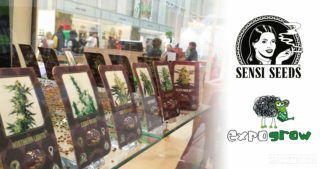 Sensi Seeds reported in December 2015 that Sativex was still not available in France, and that there was little likelihood that it would be available in the near future. 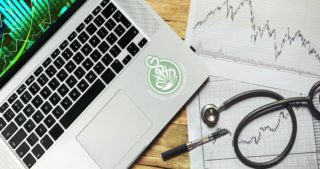 In Finland, Denmark and Norway, Sativex is available on a strictly-limited, case-by-case basis, and is prohibitively expensive compared to other forms of medicinal cannabis. However, the situation in Finland has improved significantly over the last few years (since medicinal cannabis laws were passed in 2008); the number of patients receiving medical cannabis in the form of Sativex or Bedrocan products rose from just 12 in 2010 to around 200 in 2014. In Ireland and Malta, Sativex has technically been approved but never prescribed – in Ireland, pricing issues have delayed the release of Sativex, while in Malta, the sole application received thus far was recently rejected by the health authorities. GW Pharmaceuticals’ near-monopoly on legal medicinal cannabis allows it to profit significantly, while individuals growing personal quantities of cannabis continue to be criminalised throughout much of Europe. Many individuals that grow cannabis in small quantities intended for personal medicinal use do so as it presents the only truly affordable option. That these individuals continue to be persecuted for reasons that appear to be solely economic is a dire failure on the part of the national and supranational authorities of Europe. 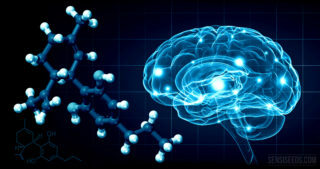 Nabilone and dronabinol, marketed as Marinol and Cesamet (or Canemes in some countries), are two single-molecule, synthetic THC analogues that have also gained approval in many European countries. Generally, they are approved for nausea, vomiting and weight loss related to cancer and HIV. 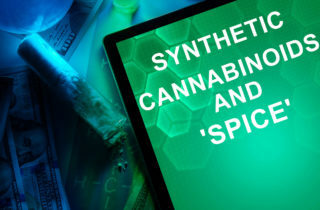 As synthetic, single-molecule drugs, nabilone and dronabinol are of limited effectiveness, and are also associated with more severe side-effects than cannabis itself. Several countries have allowed use of nabilone and dronabinol while continuing to prohibit use of medicinal cannabis itself, such as Denmark, which has approved thousands of applications for Marinol in the last decade but none for Bedrocan. Dronabinol and nabilone were developed over 30 years ago, and have never been particularly popular with either patients or healthcare professionals. Although they have been prescribed to many more patients than Sativex at this stage, there are clear signs that Sativex is now taking over in terms of availability, acceptability and popularity. 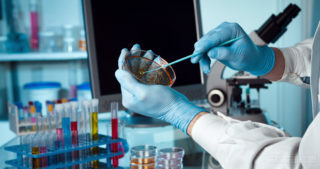 This surely represents a step in the right direction, towards recognition of the superior medicinal value of whole-plant cannabis over single-molecule, synthetic therapies. In Germany, nabilone and dronabinol are both apparently still available on prescription, but since 1991, they have not been available on the open market as finished medicinal products (i.e. they are not pre-packaged and available for purchase from pharmacies). Interestingly, dronabinol is scheduled under international law, as it is a stereoisomer of THC, whereas nabilone is not scheduled as its molecular structure differs from true cannabinoids substantially. In Iceland, for example, dronabinol is technically banned, but has been exempted and authorized for use in special cases by the Icelandic Medicines Agency. Nabilone is not subject to a ban – but each drug has only been prescribed in a tiny number of cases, under special access rules. Countries that permit the use of Bedrocan (or other products from the same manufacturer, i.e. Bediol, Bedrobinol and so on) are much more limited, and in most cases, the medicine can only be imported on a case-by-case basis by the national health authority of the country in question. As Bedrocan products are whole-plant, herbal cannabis flowers, countries that allow its use would seem to be the more progressive of the European countries with regards to cannabis use. In reality, the situation is a little more complex. Bedrocan products are considered preferable to Sativex for various reasons, but dissatisfaction among patients remains. In Norway and Finland, for example, Bedrocan products may only be imported on a strict case-by-case basis with approval from the national health authority. 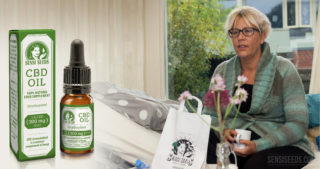 They represent a comparatively inexpensive option – in Finland, Sativex reportedly costs €650 for three spray bottles containing 810mg THC and 750mg CBD in total; equivalent total cannabinoids can be obtained from Bedrocan products costing €200 or less. However, very few individuals actually have access to Bedrocan (in Finland: 123 in 2012, though numbers are likely to have risen since then), and the number of conditions for which it can be prescribed is greatly limited. In the Netherlands, Bedrocan became the sole licensed medicinal cannabis producer in 2003, with the implementation of the 2001 law purportedly legalizing cannabis for medicinal use – which also saw the creation of the Dutch Office of Medicinal Cannabis (OMC). 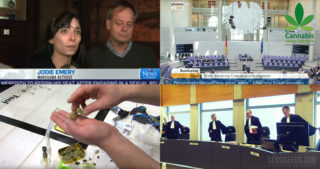 But prior to this, medicinal cannabis (reportedly cheaper and more effective) was available from at least one other supplier (Maripharm BV, a company that is now restricted to making CBD-only products) and utilized by thousands more patients, who were prescribed cannabis by their doctors and obtained their medicine directly from over 1,000 different pharmacies. This situation wasn’t legal, but it was tolerated, and it appears to have been greatly preferable for patients. In 2001, the OMC was established (according to UN treaty rules, a country must establish an office to oversee medicinal cannabis if it wishes to make it available), and in 2003, the new medicinal policy was implemented. 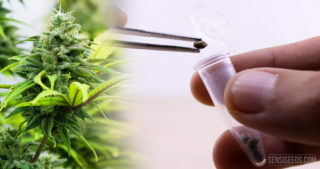 But it may have had the effect of making medicinal cannabis less available to Dutch patients – according to the BSEMC (the Public Interest Foundation for Effective Medical Cannabis), 10,000–15,000 patients used medicinal cannabis each year under the old system compared to just 140 each year between 2003 and 2013. A study from the University of Utrecht published in 2013 puts the figure considerably higher, at approximately 1,000 per year; we are currently awaiting figures from the OMC itself, and will update as soon as the information becomes available. Patient concerns regarding Bedrocan products are not limited to availability or cost, however – all Bedrocan products are treated with gamma radiation to ensure pesticides, heavy metals and microorganisms are purged out. This is a requirement of the OMC, but has caused concerns over effectiveness and safety in some patients, and led many to purchase cannabis from coffeeshops in preference to pharmacy products. Furthermore, as Sensi Seeds reported earlier this year, Bedrocan is struggling to provide other European countries with sufficient product. As the sole supplier of medicinal cannabis in Europe, demand for their services is rising rapidly, to the extent that a new production facility was opened in 2015 – but supply bottlenecks continue to occur. In a small number of European countries, the national government has taken the stance that state control and regulation of the medicinal cannabis market is the sensible route forward. Ostensibly, these state-run programs have the advantage of offering cannabis to registered patients at a lower rate than currently-available forms. Presently, the only European nations implementing state-controlled medicinal cannabis production are Italy, the Netherlands, and the Czech Republic. As already discussed, the Netherlands has awarded the sole license to produce medicinal cannabis to Bedrocan BV. Germany is now discussing plans to implement a similar program, but it is not thought that this will be in effect until at least 2017. Here, we do not class the UK among countries producing medicinal cannabis, despite GW Pharmaceuticals’ license to grow cannabis and manufacture Sativex, as Sativex is not distributed as whole-plant, herbal cannabis flowers (and is not widely available in the UK). In the Czech Republic, the logistics company Elkoplast is licensed to produce medicinal cannabis using Bedrocan strains and expertise. According to reports, Elkoplast distributed its first crop of 11 kg in February 2016; the cost of the Elkoplast cannabis is apparently around 100 Koruna (€3.70) per gram (compared to around 300 Koruna/€11 for imported Bedrocan). Elkoplast intends to produce 40 kg this year. Last year, doctors registered to prescribe medicinal cannabis in the Czech republic (who currently number around 20) supplied cannabis to just 30 patients. It is thought that patients numbers will increase significantly with the implementation of the new system. Medicinal cannabis only became legal in the Czech Republic in 2013, so progress has been comparatively rapid to date. In Italy, the army recently completed its first crop of cannabis intended for distribution to patients with a doctor’s prescription for medicinal cannabis. The Army plans to grow 100 kg this year – which is reportedly around double the quantity currently imported from the Netherlands, and regional health authorities aim to distribute it for €5–€15 per gram, compared to approximately €40 per gram for Bedrocan. Interestingly, any doctor in Italy may prescribe medicinal cannabis to a patient – this situation differs dramatically from many other European nations, where cannabis may only be prescribed by specialists such as neurologists and oncologists. Furthermore, numbers of doctors willing to prescribe cannabis appears to be relatively high, and patient interest is rapidly growing. On the other hand, this latter fact is known partially through the reported high volume of applications to import Bedrocan products made by Italian patients to the Dutch OMC. The Army crop is yet to be distributed, and the process has been subject to several delays thus far. However, Italy is demonstrating a very progressive attitude despite remaining mired in logistical difficulties, and the extent of progress here is highly encouraging. Typically, the element of state control involved in such programs is simply licensing out the right to grow medicinal cannabis to a single producer. This is far from ideal, for various reasons: supply issues such as those experienced by Bedrocan and a lack of competition on price, quality and variety are commonly cited potential problems. In Italy, state control of the production of cannabis does not exist alongside the right to cultivate personal quantities of cannabis, as is the case in the Netherlands and the Czech Republic. It was widely reported in January 2016 that cultivation of medical cannabis had been decriminalised in Italy, but it does not appear that this is entirely accurate. Italian Prime Minister Matteo Renzi in January announced a long list of minor reforms, including the lifting of criminal penalties for violations of medical cannabis cultivation rules. However, it appears that this only applies to researchers or individuals “working in the field of medicinal cannabis”, and not to the general public. Thus, the Italian system has been criticized as just another half-measure, which monopolizes potential profits and deprives patients of choice and anonymity. There are also doubts over whether the amount of cannabis produced by the army will be sufficient to meet patient needs, and as Italy operates on a regional healthcare system, some are concerned that the cost of state-produced cannabis will vary widely between locales. Reportedly, the crop will also be gamma-irradiated, which may raise similar concerns as in the Netherlands. However, the next few years will continue to see decisive change in Italy. Currently, the Italian Parliament is holding talks on the possibility of implementing further steps towards both medicinal and recreational legalization of cannabis. Talks are still ongoing, and we will update this resource when the results of the discussions become clear. The decriminalisation of personal cultivation is a very useful metric for establishing the level of tolerance a country holds towards the concept of medicinal cannabis. Cultivation of cannabis by the general public is illegal in all European countries. However, a handful of nations have decriminalised or depenalised personal cultivation or personal cultivation for medicinal purposes; several other countries have taken steps towards decriminalisation or are in the process of implementing recently-passed laws, and several more have established precedents whereby medicinal growers have avoided criminal charges despite national laws. 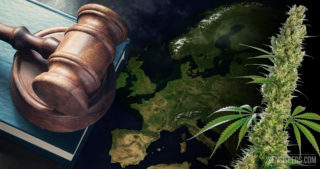 Another thing to consider is the fact that many European countries have a disconnect between legislation and practice when it comes to personal possession and cultivation. Many countries operate unofficial tolerance policies that are at odds with their actual legislation; this is extremely difficult to assess due to the fact that these policies are unofficial, meaning that records may not be kept, and also that policies may change at any time without necessarily being backed up by legislation. Thus, it’s very hard to be 100% accurate on the places where you can easily get away with growing a few plants, and we’ve done our best to clarify the picture with the information that we have available. 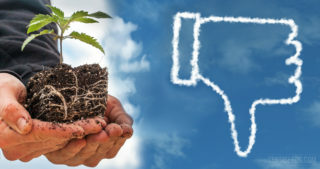 Spain, the Netherlands, the Czech Republic and Belgium are undoubtedly the most tolerant of cannabis cultivation by the public, and generally have legislation in place that confirms or protects the right of the individual to grow a certain number of plants (in the Netherlands and the Czech Republic, up to 5 plants, and in Belgium just one plant). In Spain, there is no legislation that specifies that cannabis cultivation is permitted, but laws that attest to the right to possess and consume any drug in private, and a substantial set of legal precedents that have mounted up over the last 20 years or so. In 1993, the precursor to what would become cannabis social clubs sprang into existence, using the existing laws on drug possession to argue that collective, private cannabis-growing associations should also therefore be legal. After many years of challenging and disrupting the project, authorities eventually ceased their persecution and allowed the operation to proceed unhindered, opening the door to hundreds more clubs. The UK is also an interesting case. Home-growing of cannabis is very widespread in the UK, and thousands of individuals grow for medicinal purposes. There have been several examples of individuals being treated very lightly or even escaping cultivation charges altogether after demonstrating medical need, while countless others continue to be criminalized across the country. This discrepancy partly exists due to the uneven prioritisation of cannabis between different regional police forces – indeed, several UK police forces have reportedly implemented unofficial tolerance policies for cannabis growers due to the undoubted need to free up resources to tackle more serious crimes. Switzerland has had a somewhat patchy record on cultivation rights – due to a legal loophole, Swiss citizens were from 1995-1999 allowed to cultivate “hemp” with no specified maximum THC limit, and even after the law was amended, shops continued to sell cannabis until at least 2005. Now, the law does not support personal cultivation, but reports of personal growers being prosecuted are extremely rare. Several other countries have made some steps towards decriminalisation, such as removing jail sentences and imposing fines or administrative charges – such as the island nation of Malta, which recently passed laws decriminalising the cultivation of personal quantities of cannabis. However, it is not clear how these new laws will be implemented in reality. Lastly, Sweden, Germany, and Bulgaria have all established precedents whereby medicinal growers have escaped prosecution. The small number of European states that have decriminalised personal cultivation and also permit cannabis social clubs are arguably the most tolerant of all, although no country is without its problems. For the most part, social clubs have sprung up in countries that already had a strong subculture of cannabis use, and serve as a means of ensuring quality, safety and consistency relative to the black market. It is important to note that cannabis social clubs are not an arbitrary concept by any means. 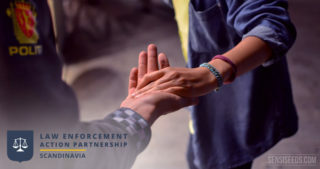 In order to be recognized by ENCOD (the European Coalition for Just and Effective Drug Policies, which has played a fundamental role in the creation of social clubs throughout Europe), would-be CSCs must meet various requirements. The club only produces cannabis for the personal consumption of its members. The club is health oriented: in production & elaboration the norms of organic agriculture are adhered too. The purpose of the club is not to make profit, but to support activism that seeks to bring to an end to cannabis prohibition. The club is transparent to its members and open to dialogue with authorities. Furthermore, the club has agreed to accept the mediation of Encod should a conflict arise with one of its members or with another CSC. If a CSC does not meet these requirements, ENCOD will not recognize the club as a legal, official entity. Despite this, there are many CSCs currently operating (particularly in Spain) without official recognition from ENCOD. In Spain, the original birthplace of the cannabis social clubs, the situation is complex. The system is generally working well, and cannabis is widely and cheaply available, but the country is not without its problems. Although clubs are meant to be run on a non-profit basis, the potential to make substantial quantities of money has attracted many would-be entrepreneurs that do not necessarily prioritise patient well-being. Furthermore, contraventions of health and safety regulations and similar petty violations have presented authorities in Barcelona and elsewhere with the opportunity to close down hundreds of venues. ENCOD currently recognises CSCs in just four countries: two in Belgium, seven in Spain, one in the Netherlands, and one in Slovenia. 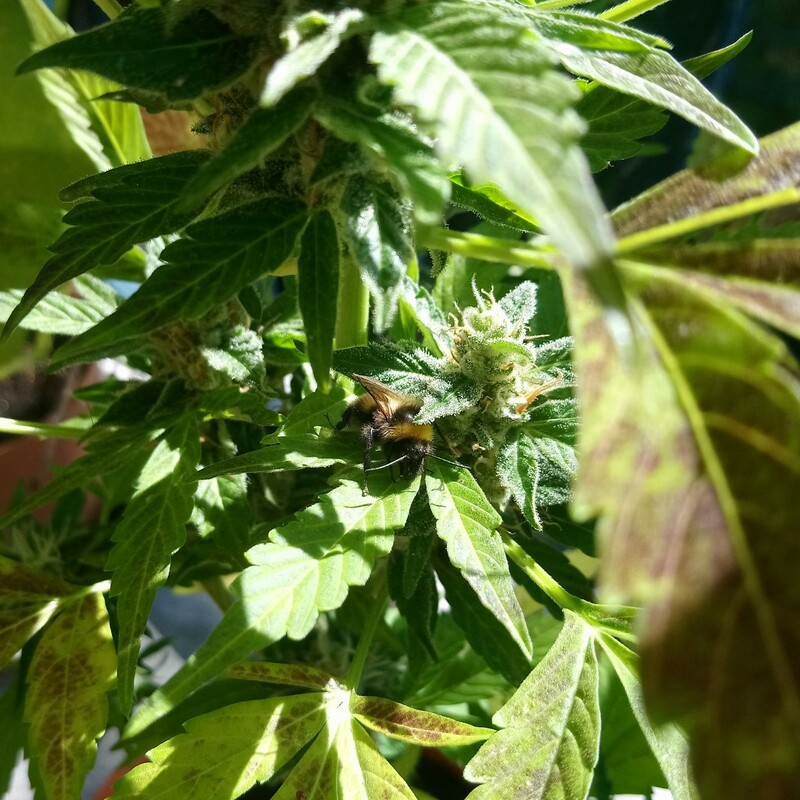 The Slovenia Cannabis Social Club is officially registered with the local authorities, and interviews suggest that they may be supplying their medical patients with cannabis – but Slovenian law does not yet support medicinal cultivation of cannabis by the public, despite a 2014 law allowing for the supply of medicinal cannabinoids. Other countries are hard at work setting up the foundations of what will become official CSCs as soon as legislation allows it. These countries include the UK, Austria, France and Germany. 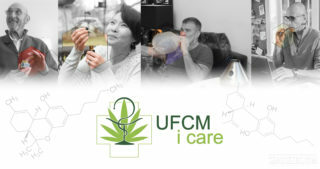 UKCSC.co.uk supplies a long list of “official” UK cannabis social clubs, some of which apparently do supply their members with cannabis – but it is important to note that, as the UK laws do not yet support personal cultivation, these clubs are not offically recognized by ENCOD. However, it is an important and rapidly growing network, which provides much-needed support and information to its members, as well as to the media, the government, and the interested public. So Which Countries Are Most & Least Tolerant? As we see, when we account for all the different variables, many of the countries that supposedly make medicinal cannabis available do not in fact do so, and in fact are no more advanced in practice than the countries that have thus far refused to consider the concept at all. So we’ve rated all the countries in Europe on a scale of most to least tolerant, with 0 as the least tolerant and 24 as the most. 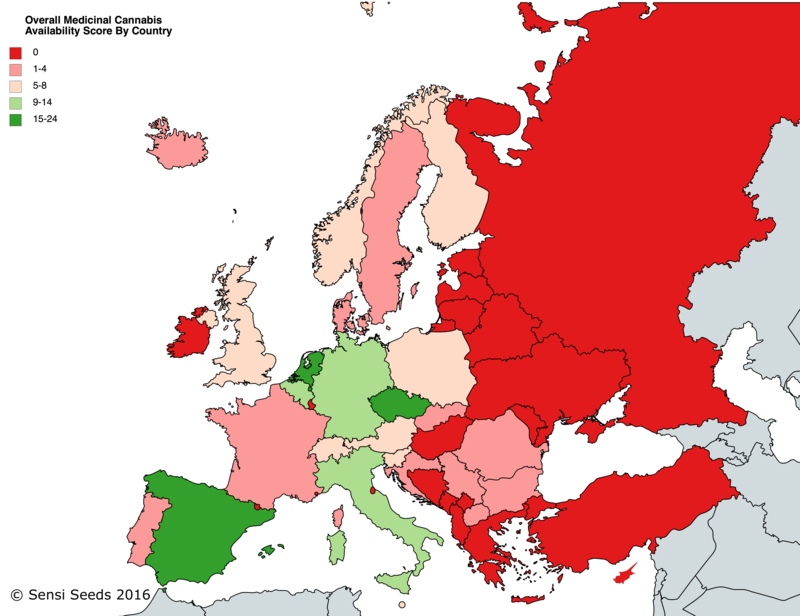 Unsurprisingly, the countries that are clearly the most favourable for medicinal cannabis in Europe are the Netherlands, Spain and the Czech Republic. The Czech Republic is perhaps the most striking in the alacrity with which it has diverged from its Soviet legacy and embraced modern, progressive drug policies which put it at the forefront of Europe. These three powerhouses are closely followed by Germany and Italy, which are rapidly making progress, and Belgium, which has an inconsistent attitude to cannabis but many patients that are currently able to access or grow their own medicine. Which Countries Are Most Hostile To Medicinal Cannabis? Next we have countries that are making some progress, but have not yet made medicinal cannabis available beyond a small number of limited cases, or remain generally hostile to the necessary legislative changes. Such countries include France, Ireland, Iceland, Portugal, the Baltic states, and all of the Scandinavian nations. Russia persists in its draconian drug policies, despite some recent, erroneous reports to the contrary. Medicalmarijuana.eu and MERCY state that Russia has decriminalised the cultivation of up to 20 plants for personal use, but upon closer investigation it appears that this is not the case: any amount of cultivation may lead to criminal charges, but 20 plants or more is considered a “large amount”. Greece is arguably one of the most hostile countries in today’s Europe, as it aggressively criminalizes growers of all types, and does not recognise the concept of medicinal cannabis at all. Indeed, but for a few exceptions, the Balkan region remains locked in deeply regressive drugs policies. Portugal remains surprisingly hostile to medicinal cannabis, despite its famous decision in 2001 to decriminalise personal quantities of all drugs. France too has persisted in hostile and regressive attitudes towards cannabis for years, and medicinal cannabis is very difficult to access. 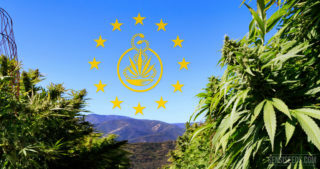 The microstates San Marino, Monaco, Andorra, Luxembourg and Liechtenstein have made very little movement towards legalizing medicinal cannabis. For residents of Andorra, at least, medicinal cannabis may be easily accessed just a short distance away in Catalunya. And Which Countries Are A Good Future Bet? Countries that have made substantial progress, but still need a lot of work put in before medicinal cannabis becomes widely available include Switzerland, Austria and Slovenia. Poland is another, but recent reports suggest that the situation is set to improve considerably in the near future. Malta, which has only just legalized medicinal cannabis in any form, is a surprising candidate. The small island nation has a thriving subculture of cannabis use; personal cultivation has just been decriminalised, and several forms of medicinal cannabis have been made nominally available (although a recent report tells us that they have thus far rejected their sole application (for Sativex) as it was not prescribed by a “specialist”). Also worth noting here are Eastern European several countries that have only recently begun to diverge from the hardline Soviet attitude towards drugs that still persists throughout the region. Several of these countries – such as Slovenia, Macedonia, Croatia and Serbia – are exhibiting increasingly tolerant attitudes towards cannabis, and as such we may see considerable progress in this area in the near future. 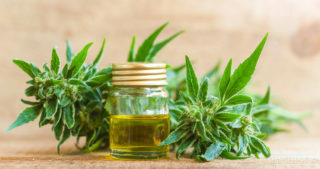 Croatia and Macedonia have both made headlines this year for implementing medicinal cannabis laws; Serbia and Slovenia have also recently legalized cannabis-based derivatives, although activists have criticised this as a placatory half-measure. 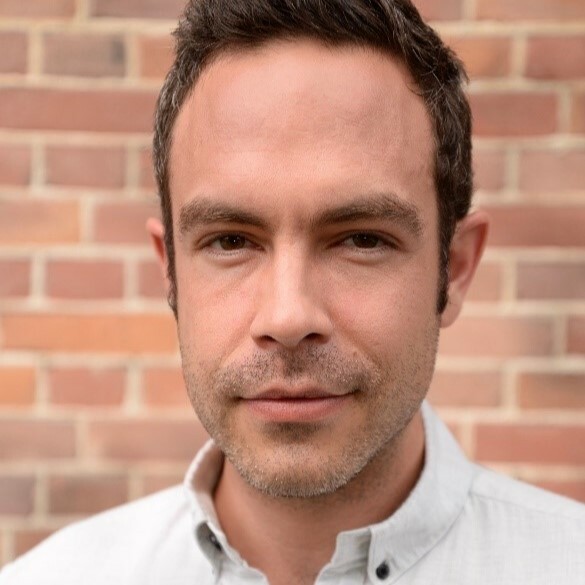 Finally, the UK has a strong base of activists and growers, but has experienced a string of governments that remain surprisingly hostile to cannabis. However, the strong grower/activist base coupled with the comprehensive network of regional cannabis social clubs that are taking shape indicate that change is imminent. On the other hand, uncertainty surrounding the Brexit vote may well see the question of cannabis legalisation pushed to the back of the queue, as it has been so many times in the past. In Serbia the law says minimum 3 years in jail for basically possession of cannabis, smoking in public or similar. I wouldn't consider that green in any map. Thanks! legally available in Croatia for medical purposes 15.10.2015. Medicines that contain tetrahydrocannabinol (THC) can be prescribed in Croatia to patients suffering from chronic health problems such as cancer, multiple sclerosis, epilepsy and AIDS. Regulations limit the quantity to 7.5 grams per month, and patients can receive a prescription of up to 30 days. It remains illegal to grow marijuana at home. Thank you for your comment and the information :) I have passed the link on to the author of this article. We hope you are enjoying the blog! Thanks for your comment, that's a really good question! I'm going to have to do some research to get to the answer, it may even lead to a blog article depending on how much information I am able to get. I will certainly get back to you once I know more. I'm wondering in which countries would be legal for me to setup a shop and sell marijuana for medicinal purposes in some countries. Thanks! 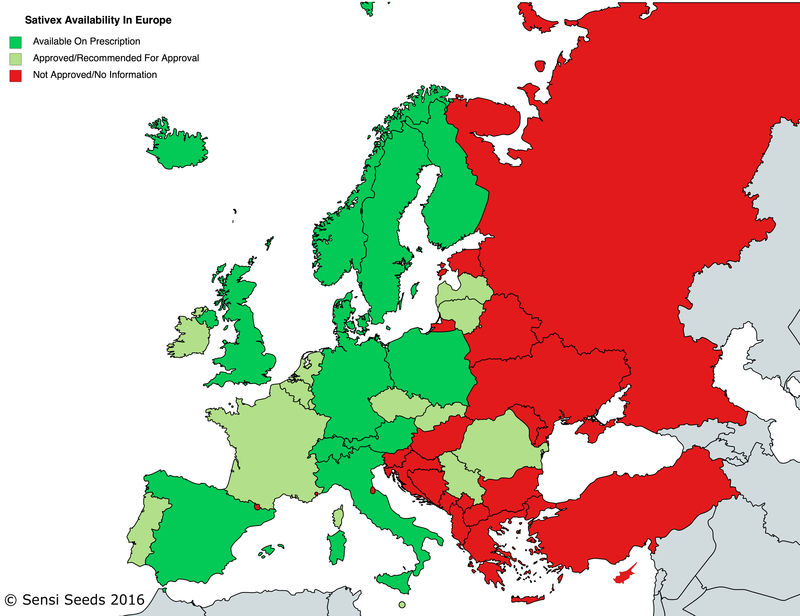 What is your source for the "Medicinal Cannabis Legality & Availability In Europe" chart? From what I know, in Lithuania (which is marked as green in your map) marihuana is in the "prohibited to use for medicine" list. Thank you for your comment, I will check the link you have kindly provided and contact the author of this article if need be. Hi there, thanks for commenting... Lithuania got the green label on the first map as Sativex was apparently approved for prescription in the country. However, on rereading the source material, it is unclear as to whether GW Pharmaceticals has achieved approval in Lithuania. We will check into it more thoroughly and issue an update. Thanks again. This gives me hope. I live in Norway and have MS. My Neurologist prescribed Sativex and it seemed to work great for a while, but...... I got sick as a dog. I also have Ulceros Colitis an it made my gut go completely wild. Ended up in hospital with i.v. to get some Electrocytes and moisture back in my body. I have tried two more times after that, with the same result. So I've found out that if I'm ever to walk again (like I did in the begning using Sativex) I need the real thing. Perhaps then I can play with my grandchildren and go for walks with my husband. I will try to make my Neurologist order from the Netherlands, but I'm nor very hopeful. Thank you so much for your informative article. You're really welcome! :) Thank you for your comment and for sharing your experiences with us. I do hope that you and your neurologist are successful! This article, written with caregivers in mind, may be useful to you. Sorry to hear about your experience. It has been reported canna may be beneficiary also for Crohns and the like. Perhaps Sativex uses strains not suited for You, or, perhaps the ethanol (? ?although in diminutive amounts) messes things up for You. The real thing seems to be your best bet, but keep in mind, You must do your research on strains, to find the one best suited for your needs. Obviously characteristics such as "couch lock" and "dry mouth" are to be ruled out. Would be really interesting to follow up on how it will work out for You. It's very misleading to state that Sweden has set a precedent to allow medical users to grow. The legal reason for the verdict was that there was no other legal way to obtain Marijuana if you truly needed it and no other known medicine could help you. The response was to make Bedrocan sort of available (so far no more than 2 patients have received it). This in effect nullify this precedent. Hey guys! What is the source of the maps? I a journalist and would like to do a similar overview on the availability of cannabis based medicine in Europe! Please give me a quick reply asap. Thanks for your comment. Our graphic design department made the maps specifically for this article. If you are interested in using them, please email me at scarlet@sensiseeds.com and I will pass your request on to the relevant department. everything works with benzodiazepines here. Portugal clearly NOT green. The medical marijuana availability is almost ZERO and physicians who prescribe it face criminal charges. Sativex and other marijuana based although not illegal are little available and almost never prescribed. Portugal is currently being used by foreign enterprises (UK GW and Canadian companies) for the production of marijuana to export but medical marijuana in any form is far from being available to Portuguese patients. 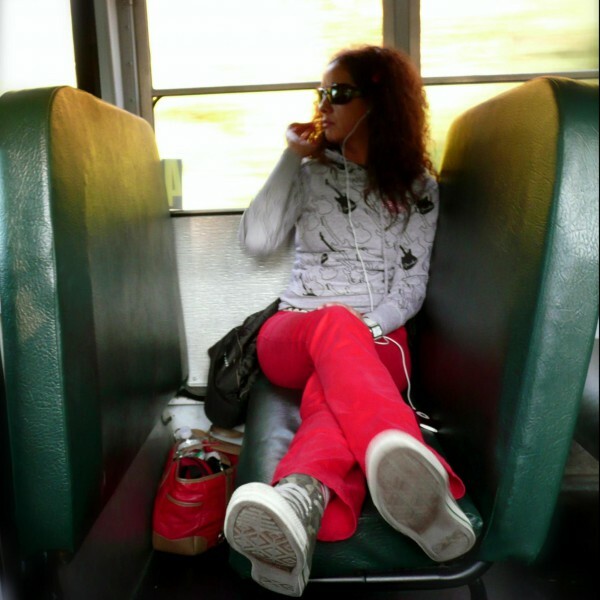 Although decriminalized since 2001, personal use is still penalized. In 2015 there were 10,300 cases of drug misconduct, 85% linked to the possession of 'cannabis', the highest figure since 2001 and an increase of 15% over the previous year. Some countries that have passed laws supposedly allowing for the provision of medicinal cannabis do not actually permit anyone to use it; other countries do prescribe certain cannabis derivatives or synthetic cannabinoids, but do not allow whole-plant cannabis, while others have relatively relaxed laws that allow for personal medicinal cultivation, cannabis social clubs that supply medicinal users, and a range of different prescription medications." Cannabis laws in Italy are very, very different from what you describe. It is true, patiens have "access" to medical cannabis, but that amounts to much less than 100kg per year (around 10kg). Patiens last year (2017) ended up being without cures for 9-10 months. Disponibility ended at around END of february. In Italy you CAN smoke marijuana, but you CANNOT possess it (pretty confusing, eh?). In Italy you cannot also grow marijuana, as the limit for possession is stated below 10g, and we all know marijuana doesn't yield so little. Even if the plant is grown in a cup of beer, it yields more. If caught in possession of one single plant, the grower/user risks from 2 to 6 years in jail, plus a fine going up to 80.000 euros. If caught in possession of 10 and more grams of marijuana, the consumer risks both jail for potential drug traffic, and a good 12-18 months of Rehabilitation for "marijuana addiction", no matter what was the amount or the purpose of its detention. I'd move Italy from the so called "decriminalized" area 'cause it's certanly not. Italy laws regarding marijuana are dumb, and more aimed towards industrial hemp and hemp flowers (no thc, high cbd, no medicinal properties), rather than actual medical or recreational marijuana. In a place suffering with 2 thousand billions in public debt, marijuana could save the country (at least 4 million consumers daily, more than 9 in their lifetime) in less than 25 years, only by taxes. Yet, this is the actual situation, and doesn't keen to move towards proper legalization and liberalization of our private lives, and human rights. Thank you for your comment and the information you have given us on Italian law. We are planning to update our entire series of 'Cannabis In...' articles in the near future and so I will pass on your comment to the writer. This has no thc in it at all and I assumed that as it was easily available online with many good review that it was legal . Whilst your article on legality in Europe is very interesting it doesn’t seem to refer to the cbd e juice I have bought. Is this product legal in UK? It’s not on prescription. Also is it legal in Spain? It’s not clear enough. Thanks for your comment. I'm afraid I can't answer your question, as your e-liquid is not one of our products; also this article is only concerned with medicinal cannabis, not e-liquid. If possible, I recommend that you check with a legal specialist in your area (it's not clear to me where you are). The CBD e-liquid from Sensi Seeds is legal in both Spain and the UK though. Sorry I can't help you further. My Partners and I are very active in North America with top players in the Medical Marijuana sector. My partners will be visiting Europe in November, so perhaps we can schedule a call to discuss cooperation beforehand with anyone you may know in the sector. Thanks for reaching out. I have forwarded your comment to the relevant department so that they can take the appropriate next steps. Thanks for you comment. Unfortunately I do not know the answer to your question; my advice is to consult a qualified legal professional to make sure that you get the right information. Sorry I can't help you further, and I hope you continue to enjoy the blog. Spice, Blaze, Sense, Yucatan Fire… the names vary, but their legal status is the same. These exotic names are all for substances that are legal highs. Or should we say that are still legal highs?! Fewer pain impulses, better concentration and a clearer head. 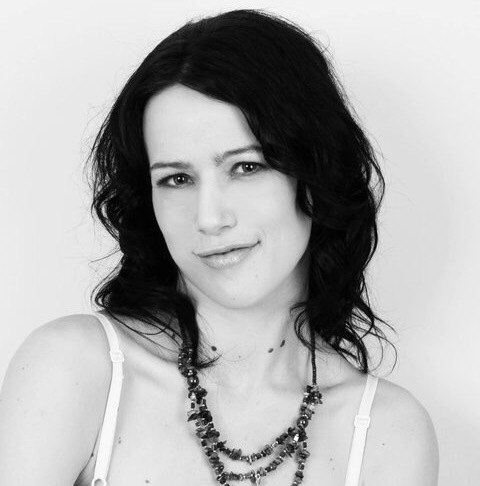 In this interview, Thea, who is married and a mother of three, shares her personal experiences with CBD oil from Sensi Seeds. A family member gave it to her hoping that it would do her good. You can read the whole report here. On 9 March 2017, the long-awaited legislation on the use of cannabis as a medicine entered into force in Germany. 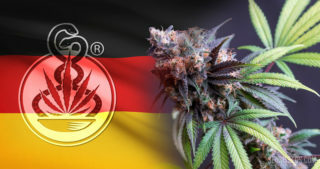 Now that this legislation has come into effect, doctors in Germany are able to use a simple narcotic prescription to prescribe cannabis buds and products. 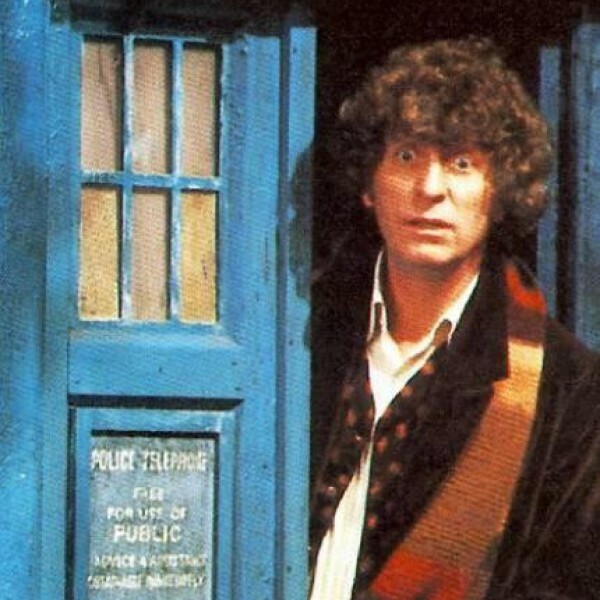 This article examines the matter in detail. 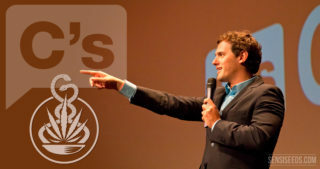 In February 2017, Ciudadanos and the OECM presented a Non-Legislative Motion in Congress in order to regulate medical cannabis in Spain. Its objective is to address the needs and demands of Spanish patients, as well as to open a parliamentary debate about therapeutic cannabis – a treatment backed by scientific evidence. Facebook continues to delete cannabis pages, but why? To our surprise and disappointment, Facebook has removed several posts from our wall! We investigated thoroughly and discovered that other cannabis companies have had the same problem. So what’s behind this purge on perfectly legitimate businesses? Read on. Medicinal cannabis is becoming more and more accepted the world over, as an increasing number of countries is moving towards a health-focused approach to the plant. Good news for patients, one would say. But the fight isn’t over yet, as shown in this report from Cannabis News Network. 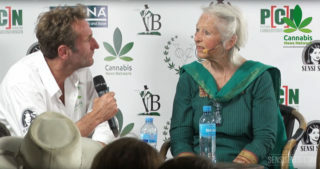 Watch this rare interview with activist, author, publisher and undisputed French Grande Dame of cannabis, Michka! CNN’s Steven Kompier sat down with her at the Cannabis University, a new feature of Cannabis Liberation Day, for this illuminating discussion about what the plant means to her. 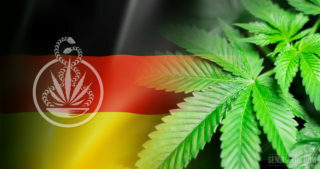 With the new law on cannabis as a medicine, medicinal cannabis became marketable in Germany. Since then, it has been possible to bring it with you to other European countries. Read about what you need to consider here. Visit Sensi Seeds at ExpoGrow 2017! It’s that time of year again! We’re packing plenty of seeds, t-shirts, advice, smiles, and of course the Sensi Seeds expo booth, and heading for Irún for the sixth edition of ExpoGrow. One of the biggest European cannabis fairs, ExpoGrow is going from strength to strength. Find out more about this fabulous fair here, including which seeds we’ll be giving away! 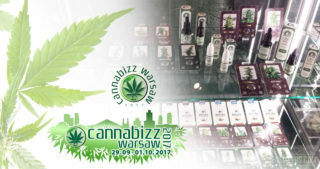 Come and discover the brand new Cannabizz Warsaw fair in Poland! Find Sensi Seeds at stand 302 and get a free pack of Afghani #1 Feminized with each purchase of seeds. 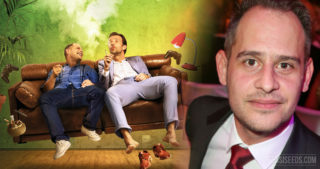 Moritz Bleibtreu is quite outspoken about cannabis, and starred in German stoner movies ‘Lammbock’ (2001) and ‘Lommbock’ (2017). Read more about him here. Six months after legislation was passed for its medicinal use, there is a massive shortage of cannabis in Germany’s pharmacies. The five Tweed strains sold out weeks ago, and the earliest delivery date is a week away. Law Enforcement Against Prohibition is fast becoming a worldwide organisation. The launch of LEAP Scandinavia in November 2017 brings the Nordic countries into what could be one of the most significant armies fighting the drug war – and they're on our side. 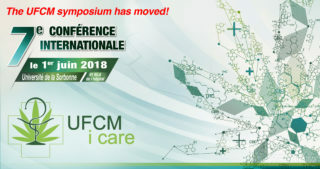 For the first time, UFCM ICare (French-speaking Association for Cannabinoids in Medicine) will host its symposium during springtime, in ‘Université de La Sorbonne’. Since its creation, the association has gathered medical professionals from all over the world, for them to learn from each other, and stay up-to-date on the use of cannabinoids in modern medicine. 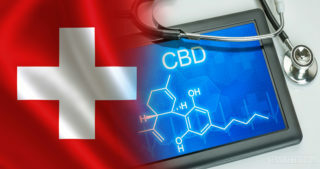 CBD weed in Switzerland: One step before legalisation? 66% are in favour of legalisation: Is the CBD boom the first step towards legalisation in Switzerland?